As anyone who has tried to grind a resin in preparation for a making a tincture, incense blend, Bakhoor, or for filling capsules knows, grinding them by hand in a mortar & Pestle, is a traditional, though time-consuming process. Messy too, as it usually involves pieces of resin flying out like shrapnel from a grenade for quite a distance. Pieces, that if left unattended on a carpet will get ground in and attach themselves permanently and will be a pain to remove anyway you look at it. When one gets smart and decides to use an electric coffee or herb grinder, a different issue and technical difficulty arises. A bit of the resin will break down in the grinder, just a bit, before the resin starts heating up from friction, gets soft and gummy, sticks to the blades, creates a mess of un ground semi-soft gum around the inside of the grinder chamber, and before you realize what’s happened, the blades are spinning freely as if there is nothing in the grinder.. And that’s about as far as you are going to get with it! You can try scraping the mess out and grinding it again before it cools and solidifies again.But you will just get more of the same. Mind you, there are herb grinders on the market now that run at a slower speed to keep heat to a minimum and keep the volatile oils/Medicinal constituents in herbs. However, they still do not grind resins without melting them. Keep in mind that all Frankincense types, ( and Myrrh), are composed of Gum, Resin and volatile oils in different ratios. One thing this means is when we first grind Frankincense and other oleo gum resins, we liberate moisture that has been locked in the water soluble gum portion since the day this fragrant sticky stuff bled from a tree in the desert. These materials can contain up to 10% moisture hidden away. After grinding I spread it out on a plate or in a bowl and stir it around periodically an hour or so to expose the moisture to dry air and ensure it will not clump in storage or capsules. If you have more time you can leave it in a warm dry area such as the top of a fridge to air slowly, stirring periodically. Fresh ground Frankincense powder quickly solidifies. Spread your powder out and disperse the newly exposed moisture before storing. Another trick when working with Oleo-Resins, is that the clean up of sticky resin residue, (on hands, tools and surfaces), can usually be accomplished with oil, (I prefer olive oil), which dissolves the Oleoresin part. That solution is then dissolved with dish soap & warm water and finally rinsed with warm water and dried. This is a perfect solution ,(ha ha), for cleaning up most Oleo-Resins. (And leaves hands feeling beautifully moisturized!). Alcohol can also be used for cleanup, and does work well, but is a more expensive option, needs to be worked with quickly, before it evaporates. It is harsh on the hands and it’s a shame to use good, rectified, or perfumers alcohol for a simple clean up when oil could do the job just as well. Most resins commonly used for incense, tinctures, and medicine are composite materials made up of gum, which is water-soluble, resin which is soluble in alcohol and oil, and volatile oils, also called “Essential Oils”, also soluble in alcohol and oils. This is why we call Frankincense, Myrrh and other resins “Oleo-Resins” because they are more than just resins, they contain important volatile oils.(Oleo=Oil). When we distill Oleo-Resins with water or steam, to collect the volatile, or Essential oils, we are left with resins or Gum-Resins. There are a few “Resins” that have no, or no perceptible quantities of water-soluble gums, (such as Pine, Spruce and Fir species), these are considered Oleo-resins, but for the most part, all have some measurable percentage of water-soluble gum. When we burn these oleo-gum-resin on a charcoal as incense, note that the first release of fragrance is clear, “bright” and closer in fragrance to the fresh material you are burning. These are the essential oils which evaporate at the lower temperatures. After this first note from the essential oils, and probably overlapping it, the resins and their less volatile compounds will melt into the charcoal & burn. Then, if there is a prominent percentage of gum in the material as in most representatives of Myrrh and Frankincense, the water-soluble gum will yield itself to the heat. It may bubble a bit, but will not dissolve into the charcoal, it will char and burn giving off a crude smell of burnt material and form a black lump on the coal. This burnt gum is regarded as one of the ingredients in the ancient Egyptian’s “Kohl” eyeliner with the addition of Sulfide of Antimony or Lead and other ingredients. Of the Frankincense family, only Boswellia Frereana, locally called “Maydi”, and found only in Somalia, has almost no gum content, it completely liquefies from the heat and melts into the charcoal without releasing this “burnt” smell and without leaving a residue on the charcoal. I think chewing these resins is an excellent and beneficial practice. You are absolutely right that the chewed resin is still full of therapeutic compounds, especially if you are chewing Frankincense all the resin acids including the Boswellic acids are still present. Freezing and grinding them is a good approach. The only thing I would suggest is taking the powdered resins with some oily food which will help the body break them down and absorb the resin acids. Since they are already chewed, there will be no water soluble gum in them just pure oil-soluble resin. An Avocado, some peanut butter, salad dressing or any other product that has a high oil content will suffice. Great info about 2 of my favourites healing resins. I do shamanism and would like to be able to spray a fine powder of myrrh and frankincense on the people who come to visit me before start healing. Do you have any advice how to go about creating such a concept into reality. Is there anything you know of which could spray such a preparation? I was thinking maybe a mechanical device. Maybe you know of a more natural “sprayer” or “blower” and if it is possible and how to grind the resins fine enough. First of all, I apologise profusely for the extremely late response to your question. I have gotten behind on correspondence in all venues. I imagine you grinding your resins with much attention and intention to an extremely fine powder. If you can spend the time, a very fine powder of Frankincense can be created using only a mortar and pestle. With a bit of patience you will be rewarded with a higher quality product than that from an electric grinder. When people come to you and the scene is set, you place a teaspoon of your resins in your palm. Cupping both hands you say your special words and gently puff a cloud of fragrant powder over and around their heads. This could work best if they were sitting/kneeling and you were standing. I think this system would be my choice if our roles were reversed. The only mechanical alternative I would consider is perhaps using a special bowl from which to blow the resins. I feel there is magic in the direct connection with you that might get lost if you use a more mechanical device. What’s the best way to clean the interior of the coffee / spice grinder? Oil? The grinding instructions worked a treat, so I want to avoid messing up the grinder by cleaning it in the wrong fashion. Thanks for the excellent product and information! I run some dry uncooked rice through the coffee grinder a couple of times. That usually takes care of most of the resin stuck inside. After that, if needed, you could scrub it a bit with either alcohol or vegetable oil on a piece of cloth or paper towel and wipe it dry. Thanks mucho! I appreciate the help. Hi, I have some frankincense tears, and would like to infuse in olive oil. Can you tell me what kind of grinder/food processor you use? Also, have you ever tried to blend oil and the Frozen Frankincense? To grind small amounts of Frankincense, I use a simple coffee/herb grinder. If I need to grind pounds or Kilograms of Frankincense I use a large blender with a heavy glass chamber. 1 – is administration via a capsule a good way to go? Just filling with the ground powder (air dried as you have suggested to minimize the water content/ reduce clumping) – should I mix it with coconut oil or olive oil to increase absorption – within the capsule? Or would perhaps taking a teaspoon of the ground powder plus one of these carrier oils be equally effective or result in better absorption? 3 – I’ve read several of the in virto medical studies on the use of AKBA for cancers etc – but am not sure how much AKBA / boswellic acids is approximately in one piece of oleoresin of B. papyrifera – or where to even find that information – would you have any ideas on this? Any sort of conversion factors for 1 mg of boswellic acid = how much oleo resin? 4- would you agree using the entire oleo resin would be the best in this situation? Not sure if you have heard anything more from any others on this particular use? I was thinking of trying your method of extracting the boswellic acids and then mixing with coconut or olive oil and administering 1-2 drops of this mixture under the tounge as another alternative – any thoughts on this? Apologies for all the questions but I really do appreciate your thoughts on this as it seems as if you have a great deal of experience with the use of frankinscense – I am mainly trying to get most of it absorbed internally so it has the best chance of crossing the blood brain barrier and both addressing the anti-inflammatory (for brain swelling due to radiation therapy & tumor) & anti-tumor effect – I realize B. papyrifera also helps w/ antianxiety & well being as well which would also be very welcome in this case. Any insights & recommendations would be very greatly appreciated. All 4 of the Frankincense types that contain Boswellic acids can be processed in the same way. These are Boswellia Carterii, B. Papyrifera, B. Sacra and B. Serrata. Regarding their Boswellic acid content we can say that in general, they all contain approximately 20% water soluble gum, 5% water, 10% essential oils and 65% resin which is comprised mainly of the Boswellic acids and a small % of other resin acids that also exhibit anti-inflammatory properties but have not been studied to the same degree as the Boswellic acid group. I think a good guesstimate of the % of Boswellic acids in any of these Frankincense resins would be about 50%. So, for each Kilogram of raw Frankincense you will have about 500 grams of Boswellic acids. I want to stress that the value we place on AKBA -acetyl-keto-beta-boswellic acid-compared to the rest of the Boswellic and other resin acids in Frankincense has a lot to do with the nature of our capitalistic market and is not based on the true value of each compound or that of the oleoresin as a whole. If it was more profitable to the pharmaceutical companies to sell us the whole fresh resin they would. They make their money from owning patents, “discovering”, processing and marketing single molecules and compounds found within the natural products we have already been using in our traditional and folk medicine for hundreds if not thousands of years. Food for thought. As far as getting Boswellic acids into the bloodstream. they are indeed absorbed when ingested. Studies show that when they are taken with oily food the uptake and absorption of the resin acids into the blood stream is much higher. Oils, fats and Lecithin all facilitate their breakdown and absorption by the body. Powdered frankincense can be taken dry or infused in warm oil or Lecithin to facilitate easier absorption by the body. It can be taken in capsules or loose. As far as a beginning dose, you could start with 1/4 or 1/2 teaspoon. I personally take ½ to 1 level teaspoon of powdered Frankincense 3-5 times a day when I feel the need. The only side effect I have heard of is the rare occurrence of an upset stomach. Something to note is that the finer the material is powdered, the more quickly it dissolves. This is seen when making tinctures and oil extracts of Frankincense and will also contribute to better/quicker assimilation in the body. I hope I managed to answer most of your questions. My sister and I each have done the Biodynamic Three Kings Preparation for our garden plots, and have always had a problem with the mix gumming up and adhering to the side of the mortar; the resulting mass is nearly impossible to remove. All I could do was hope that my good intentions would carry the day ( actually, the night – the preparation requires 1 hour of grinding at midnight). Your suggestion to freeze the resins and the equipment makes excellent sense. I’m also going to desiccate them with silica gel in advance (we live in PA, the humid state). Best wishes for your preparations tonight. Recently I discovered that as you grind Frankincense into smaller particles, it releases moisture that has been trapped in the gum from when it came out of the tree as an emulsion. I find spreading it out periodically in a dry place helps dissipate this moisture, keeping it from gumming up or clumping in the mortar. These drying breaks can lend a nice rhythm to the process. You have some thought provoking posts there!! Thanks for the reblog. So glad I found this site. Being a former Wicca student and still part of the pagan community, I have been so frustrated with the emphasis on using self-lighting charcoal for ritual purposes. For starters the smell of the charcoal overwhelms any positive use of the herbs or incense. Also, the charcoal is infused with salt peter (forget the scientific name, sorry), sparks while lighting, is noxious and messy, and, as I mentioned, negates the use of incense or resins or herbs at all. I’ve since found that many of the resins I’ve been buying (dragon’s blood, 3 kings, etc) are clearly not what they claim to be, but the odor of the charcoal made it impossible to tell. So with that in mind I’ve been on a months-long search to find a suitable substitute. I bought an electric burner, which is perfect for resins and homemade crumbly incense. Now I’ve expanded my experimenting to makko powder for making my own cones. I love your suggestions for powdering resins–my only concern is that makko powder uses water to activate the binding agent–will that have a negative effect on the powdered resins, since water tends to make them lumpy again? Hi Mary and thank you for your kind words. Congratulations on purchasing an electric incrnse burner! These allow you to really appreciate the finer nuances of many delicate and fragrant materials without the distraction of charing and smoke. The Saltpeter charged charcoal pucks do indeed almost defeat the purpose of burning incense. Regarding using a water souluble binder in your cones or stick incense there should be no problem. As long as your oleo resins are finely powdered and blended before you add water there should be no clumping. Also adding your powdered binding agent dry to the incense mix before adding water may be an alternative. Just make sure everything is powdered fine and blended homogeneously. 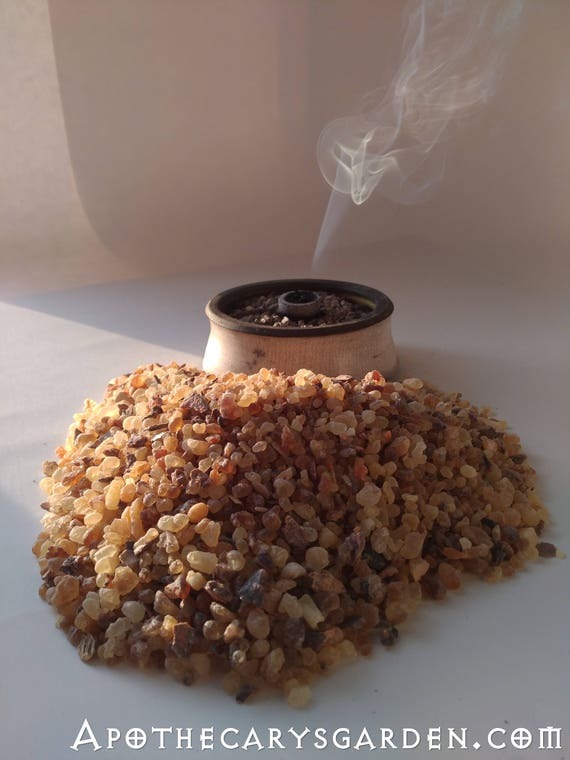 If you are using Frankincense or Myrrh in your blend it is good to keep in mind that they too have a portion of water soluble gum in their makeup already. This acts in a similar way to your Makko. There is 65% gum content in Myrrh and about 30% gum in Boswell Seratta, Sacra/Carterii and Papyrifera. They are much better informed than I. Good luck and enjoy your incense journey Mary! So Dan would U tell me the functions of final bye product of frankincense , myrrh and opopanx after distillation. I am happy to share what I can with you. From studies on processing your oleoresins and my personal experience with them. Please email me at dnriegler@gmail.com and I would be happy to continue this conversation with you. I just ran accross your blog today looking for answers for resins. I just purchased some frankincense, myrrh, and copal resins. I noticed in a previous statement regarding womens health, you stated how to infuse the resins in olive oil. I am interested in this method for two reasons. I am concocting oil fragrances and need resins for not only their smell but for their fixative properties. Can you advise me on a plan. I have my own thoughts, but since you are the expert, I’d like your comments and suggestions. Hi Rita and thank you for visiting my blog. I wouldn’t call myself an expert in any way. I have a little more experience than most people, and I’m happy to share what i do know. You will find a couple of posts in the top navigation menu on making oil infusions or extracts from oleoresins. 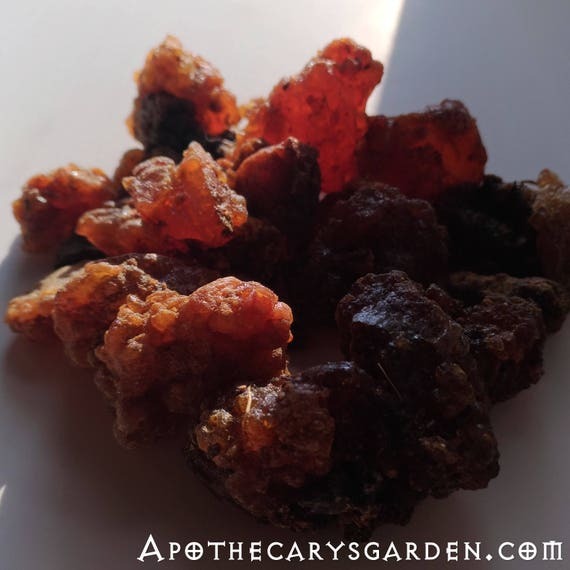 I suggest you start with this one- http://apothecarysgarden.com/2014/07/30/how-to-make-a-whole-extract-of-frankincense-and-other-oleoresins/ I’ll will give you a good idea which methods work best for your application and which oils you can use. The only thing I would add here is that Myrrh can be a frustrating sap to work with due to its high water-soluble gum content, so perhaps leave it to last. I hope to write specifically about making oil infusions with Myrrh in the near future. For a more intense fragrance you can experiment with a higher proportion of oleoresin to oil such as 1:1, 1 part oil to 2 parts oleoresin or higher depending on how thick a product you end up with. If you have any further questions don’t hesitate to ask. Hi. Thank you for visiting! I don’t know how the glycerin will work as a solvent. My guess is that it may break down the water soluble gum to some degree, since glycerin can, I believe, be diluted in water. To the best of my knowledge it may prove to be an unsuitable solvent for oleoresins. Please do let me know if you have any success with your compound. I’m so happy i found your site!. I found a bag of small light colored resin at the souq in Doha. I didn’t know what it was as i had never seen or heard of resins before. I asked the guy what it was and he said it was labaan, which is arabic for gum. He and another guy tried to explain in broken English that they soaked a few of the tears in water for a couple of hours until it turned milky then drank it to relieve sinus and sore throat and cough. Being interested in natural remedies, i bought it. The bag was labeled that it was from the sudan. I still did not know what it was, so I searched the web for Sudanese traditional medicine and found references to the resin of the acacia tree known as gum arabic. After more research i read about frankincense. A friend gave me some and it looked similar but smaller tears. I burned them both and the frankincense smells more lemony. How can I figure out what I have? I know now that each resin has different healing properties. Hi Robin. Thanks for dropping by. Sounds like you may have 2 types of Frankincense. Luban, loban, Lubania are all local names for Frankincense resin. Gum Arabic is a true gum and completely water soluble. When burned it would likely just smell charred while the saps of the different Frankincense trees are oleo gum resins or pure oleoresins. The fragrance lies in the volatile oils and the resin. They all have traditional medicinal applications. Sounds like you may have a sample of Frankincense Papyrifera which often comesbin larger “tears” is native to Ethiopia but does grow to a lesser degree in Sudan. And the smaller “tears” with a more lemony scent sound like Boswellia Carterii/Sacra which grows mainly in Somalia, oman and Yemen. I believe that Gum Arabic is usually sold in broken pieces rather than tears. I have a photo titled ” a visual comparison of Frankincense types” on this site and online. If you Google it you it should come up. I think B. Carterii/Sacra is included in it. Otherwise if you can send me a photo I might be able to give you a more definitive answer. Thank you, I believe you are correct, it really does resemble the frankincense, the tears are just smaller than the bag I bought here. I also compared with the comparison photo you posted and both ones I have are like the Boswellia Sacra. I wonder why they smell slightly but distinctly different when burned. Same tree just different location? I can send you a pic of both side by side with a penny between so you can gauge the size. I really would like to know what I have. am so pleased you are here and I love your site! Please do send me a photo. If you can’t do it through the WordPress comments send it to me at dnriegler@gmail.com. A mystery 🙂 I’m intrigued..
First off, I would like to say that your sit is absolutely amazing!! You relay such intelligent, highly useful, and terrific information!! You, sir, are a breath of fresh air, thank you so much!! I am so hoping that you have an answer for me, as I have been fervently searching the web, but haven’t been able to find any information about being able to extract the oils from both frankincense and myrrh resin without having to use a “still” type of apparatus and just cooking utensils one already has on hand. If it can be done, and it is plausible, I would actually prefer to extract from both resins at the same time, as I would be mixing the two oils together anyway. I sure hope that you can help me, I have been searching the net for at least 6 months now and it seems that if it can be done, you would be the best expert on the method. What you are referring to is often called co-distillation In some ways it creates a deeper “marriage” between your two essential oils. And yes it is possible to distill essential oils at home, in the kitchen with tools you would normally find in a kitchen. There is however one key tool that can easily be purchased online at a reasonable price and that is a simple glass sleeve condenser. With a condenser, home distillation is a breeze. Listed under scientific glassware on ebay you can often get one new or used for around $20.00. What you are looking for is called a “Liebig” condenser. Very simple and easy to clean. Anywhere from 8″ to 24″ in length would be perfect. I can tell by the number of inquiries I’m getting I should get in gear and set up part 2 of “how to distill essential oils from Pine and Spruce sap” as I promised a while ago. The method for these oleoresins is very similar to how we can distill the essential oils from Frankincense and Myrrh. I will set up a pot still using found kitchen items and finish that post which will give you specific instructions on how to co-distill Frankincense and Myrrh in your kitchen. I would ask two things of you. 1-purchase a simple sleeve condenser. 2-If you do not see a post on my blog in one week’s time detailing how to distill oleoresins at home, you must leave me a comment, politely reminding me that you are awaiting instructions as promised. That should do the trick. A little guilt sometimes works wonders I find. Please let me know if you have any difficulties finding a condenser. Never thought of using frankincense as a varnish! I bet it smells amazing. Do you by any chance sell frankincense by the pound? It does smell amazing Lenita! Unfortunately at this point I can only sell by the ounce. Come late fall, I hope to have larger quantities of different types of fresh harvested Frankincense . Please check back then if you still need some. Do you have any instructions as to how to actually use frankincense as a varnish? Is there anything else that should be added? I tried doing a search for instructions but didn’t turn up anything particularly helpful. I think it would be cool to use it to seal some incense boxes I’m thinking of making. I have used Frankincense Frereana, combined with Beeswax as an excellent and fragrant turning wax for wood, but have not yet made a varnish from it.. I would use alcohol or a neutral smelling vegetable oil such as olive oil or Jojoba as a solvent/carrier and perhaps try a bit of Japan dryer to speed curing if using an oil. Alcohol should work well if the product is thin and not sticky. It will penetrate deeply, but would require a few Coats to produce a shine. Spraying consecutive layers might help avoid the sticky factor or brushstrokes. I realized I misinformed you regarding wholesale Frankincense. I actually do have 2013 bulk co-op harvested Frankincense Frereana from Somaliland sitting in Israel. I had sold a quantity there as chewing gum to the Yemenite community. I just assumed you meant Frankincense Sacra/Carterii for some strange reason. Assumptions ha! It is the most expensive of the Frankincenses and not usually available in North America. I hope to write a post about it shortly. It wholesales at $100.00 a kilogram. I know, not cheap. If you wanted only half of a kilo to play with I would keep it at the same price. Luckily shipping from Israel is extremely inexpensive. It is going into the Etsy store at $10.00 for an ounce or 30 grams. The problem using other Frankincense types for these applications is that we have to remove the water-soluble gum beforehand. I was pleasantly surprised you are making wooden incense boxes. How cool is that? I would love to see photos of them. As you likely know I am making incense spoons from recycled Ebony piano keys. A match made in heaven! We should swap! Thank you Lenita, you flatter me. I usually do a two or three step process when I want to grind hard oleoresins to a fine powder. I break them up in a deep mortar, I have a brass one that I use with a heavy brass ones the, then I will use an electric herb grinder which has a larger capacity than most coffee grinders, it also spins a little slower. Then back to the mortar and pestle. As an afterthought to our earlier conversation about us in Frankincense as a lacquer base, you could use regular and cheaper Frankincense, dissolve the oleoresin part with high proof alcohol, (96%), and that would give you the same result. The water-soluble gum would stay behind where you want it. Also, another practical idea is making your own varnish or lacquer from local evergreen saps if you have any handy. Same thing, use a high proof alcohol as a solvent, then add to it or adjust it as you please. In fact I should try making both those products!! Thanks again Lenita for your comments and enjoy your creativity wherever it takes you. Hi Lenita. If you have evergreens in your neighborhood you will likely find sap accumulating where branches have been cut. If you collect this, warm it in a waterbath and filter it through an old pillowcase, then you are set. If you don’t have any local sap, I do sell it in my Etsy store and it is much more affordable than the Frankincense Frereana. Hi Dan, thank you for a very informative post and blog. I would like to make a resin paste from frankincense that can be used to seal water in wood, almost like a lacquer, but thick and gooey. Can you suggest a method that will break down Frankincense into a resin liquid while holding much of it’s original properties? Thank you for visiting and for your question. 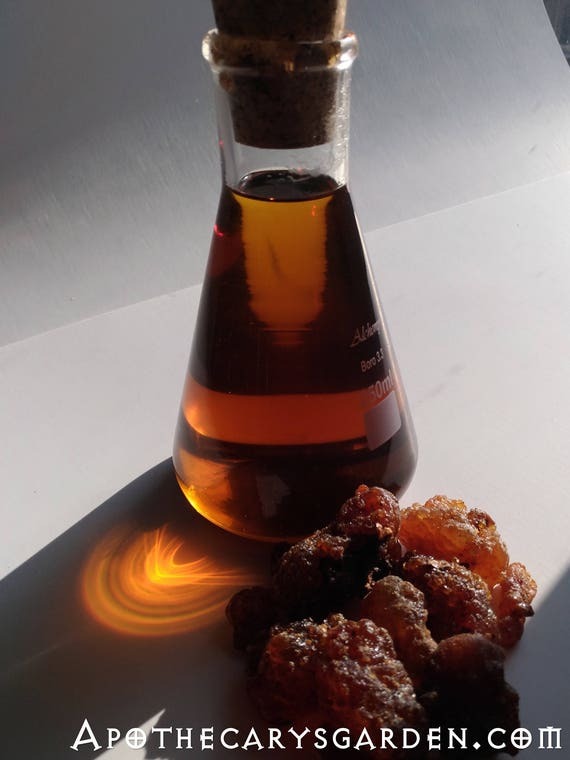 Most types of Frankincense with the exception of Boswellia Frereana from Somaliland, contain a high percent of water soluble gum which would render your paste ineffective as a waterproofing medium. I would take one part powdered Frankincense powder, combine it with 1-3 parts by volume high proof -(96%) alcohol and mix them together in a waterbath. Pour off or filter the clear liquid. (It will be fragrant and sticky when the alcohol evaporates). The water soluble gum will remain behind undissolved. You can thicken this product by evaporating the alcohol with gentle heat, or thin it further with alcohol. It will clean up with alcohol or vegetable oil such as olive oil. You should have a very fragrant, water resistant liquid or sticky paste after the alcohol evaporates. If you evaporate all the alcohol you will likely be left with a clear, fragrant and hardened resin. I hope this was if some help. Please let me know if you have any questions and I would love to know how it worked for you. I want to grind frankicense tear but l want to know if l can use it in large perfum production. You advice is needed. Hi Kenny, yes you can use the Frankincense tears in perfume production, by either making a tincture, an essential oil or a resinoid from the tears first. All these products require that you grind the Frankincense first. Let me know if you have any other questions along the way. Hi Butterbabe; Thanks for your comment and interest in my blog. Myrrh essential oils can be easily dissolved at room temperature in Jojoba oil. By warming this mixture in a water bath, double boiler etc., and warming the additives, you will be able to mix it with Cocoa Butter, coconut oil, and many other thicker waxes and butters. Please see the recipe for making a solid mustache wax on the navigation bar at the top of the website. The procedure for incorporating other oils, waxes and butter with Myrrh essential oil, is the same. If your Myrrh does not mix readily, it may be a solvent extracted Myrrh product,and not a true distilled essential oil. Butterbabe, I have to correct my earlier reply. It isn’t Titanium Oxide I was referring to as a sun blocker, but Zinc Oxide. Please note this. Hello Dan! I discovered your blog a couple of days ago researching the hyaluronidase inhibiting properties of myrrh and I have a question. Since the resin parts of myrrh can be cleaned off the grinder with oil (I believe you mentioned olive oil) is it possible to dissolve the myrrh in oil instead of alcohol (tinctures)? I would like to use myrrh for cosmetic purposes and oil would serve my purposes better than alcohol. 🙂 If so, is there any particular type of oil that could work or is one type more effective? I realize I’ll probably have to use some water to dissolve the gum components which is fine. Thanks! Unfortunately, I too have found Myrrh more difficult than other oleoresins to dissolve in vegetable oils, even with fresh and pliable material. Jojoba oil often works just as well as Olive oil as a solvent in most cases, has good properties as a cosmetic base and keeps better and longer. Here are some thoughts and some ideas that I plan to experiment with in the near future, and perhaps some food for thought for your own attempts to dissolve and separate gum from oleoresin of Myrrh. Grind your Myrrh as fine as you can before mixing it with the oil. I would try, gently and carefully, raising the temperature of the Myrrh and vegetable oil above that of a water bath, (100 Celcius). An old fashioned oil-bath would allow you to control and distribute the temperature evenly. As soon as, and if it does dissolve, reduce the heat to avoid losing more volatile components through evaporation. There is an idea floating around, that since fresh oleoresins dissolve more readily in vegetable oils than drier and more mature material, that adding distilled essential oil of Myrrh to your powdered material, first, may make it more receptive to, and soluble in vegetable oils. I have done some work using emulsifying waxes as intermediates, and they have worked well with some of the other oleoresins and oleo-gum-resins. I hope I have been of some help. Please let me know if I can be of further assistance. Thank you Steve!! For your kind words and the very useful information. I had no idea all those trees were of the same family! Very cool. Thank you for your reply. I did check out the post you recommended. I have Boswellia Carterii. If I understand correctly, both alcohol and water are necessary to extract the properties. So 50 grams of ground frankincense to 100 ml of liquid which is 50/50 water and alcohol. If I am misunderstanding please let me know. I believe I have a basic understanding of tincturing, but if you would share your instructions, it would be appreciated. Hi Joanne. Sorry for the delay. I am thinking of writing a post that would detail the process of tincturing oleoresins, but do not want to keep you hanging till I do. Sounds like you do have the basics of general plant tincturing. In the case of oleo resins, one can step it up a notch by preparing the menstrum, the alcohol water mix to match the proportions of water-soluble gum and alcohol soluble resins and oils in the particular oleoresin one is tincturing. In the case of Boswellia Carterii which you are working with, I believe, it averages around 20% gum in its composition, the rest would be resin and essential oils and a small amount of insoluble material. So.. If you can make a menstrum, or tincturing mix made of 20% ( distilled), water and 80% alcohol, I believe it would be ideal. Bottom line though, you could still make an effective tincture with different ratios of alcohol to water, but this is what I would aim for if you do have access to relatively pure alcohol. And yes. 100 grams of finely ground oleo resin should be mixed with 200 to 300 ml of your tincturing liquid. Place the powdered oleoresin and liquid together in a tightly closed glass jar or mason jar, in a relatively warm place, ( on top of a fridge, by a furnace etc. ), and shake at least once daily. I find oleoresins, when ground to a very fine powder do not need to infuse as long as most plant materials so 3 weeks, ( or a full moon cycle of 27-29 days), sitting together should be fine. When done, filter your tincture and separate it from the material. You can use a paper or mesh coffee filter for this if you are not in a laboratory environment with sophisticated vacuum filtering apparatus. Squeeze out as much of the tincture as you can by hand, let it sit for a couple of days so the solid particles settle and pour, or siphon off the clear liquid. I usually let it settle once more for a few days and then pour it off again into a dark glass bottle or dripper bottles for use. As per all tinctures, keep it out of direct sunlight and in a relatively cool place. Tinctures from oleoresins can keep their potency intact for many years if stored properly. One trick you could try, is to run a small amount of vegetable oil, with your finger along the thread of the mason jar you are using for infusing the tincture. Keep it away from the upper lip of the mason jar so it cannot enter the tincture, but this will make sure the sticky resins do not make your tincturing jar impossible to open when it is time to filter it. I hope this helped fill in the blanks Joanne. Again, please let me know if i can be of further help. Thank you for your reply. I did read your post that you referenced. I have Boswellia Carteri. So, I would need water and alcohol to extract the gum and the resin/volatile oils. Is it 50 grams of ground frankincense to 100 to 150 ml of alcohol and water divided equally? I think I understand basic tincturing, but I would appreciate your instructions in case I am missing something. How do I tincture frankincense? Thanks for your interest in my blog and your question. You tincture Frankincense the same way you tincture other plant material. With a mixture of alcohol and water. If you used only alcohol it would be called an extract. If you used only water it could be called an aqueous extract. – Grind your Frankincense as fine as you can. This will facilitate a quicker transference of chemical compounds to your tincture. – Use a ratio of 1 part ground Frankincense to 2 or 3 parts liquid. (Alcohol/water). I do this by weight of the material and volume in milliliters of alcohol/water. So, for instance,50 grams Frankincense powder to 100-150 Ml. Of liquid. -You do not need to let the mixture sit as long as a regular tincture. 3 weeks of regular daily shaking and sitting in a warm environment often suffices, if finely powdered. The oleoresins have already been separated from the “body” of the plant, unlike whole plant tinctures. If you need basic tincturing instructions, please let me know, and I will fill you in. Hello! I appreciate this information, and I have also same question, I heard that myrrh and frankincense has been used for fallopian tube blockage in women’s, when aapplied as a tampon, do you have any idea about this method? If you do, how can I prepare it? I haven’t heard of that method, but I don’t have a lot of experience with women’s reproductive issues. If I were to try it, I would do so cautiously, with an eye to how the body reacts and feels. I would probably grind the Frankincense or Myrrh to a fine powder, put them in a waterbath, with a safe vegetable oil such as cold pressed olive oil, 1 part resin to 3 or 4 parts oil and stir them or let them sit for an hour or so. You could also put them in a sealed jar in a warm place for a couple of weeks, and shake them 2-3 times a day. I would then filter the fragrant oil through a coffee filter or old pillowcase. Adding 400 IU of Vitamin E per cup of oil wouldn’t hurt either. This seems to me the safest way to load a tampon with the benefits of Frankincense or Myrrh. Again, do so cautiously, everyone reacts differently to things. Good luck and please let me know if you had any success with this method, or if you have any further questions.